One of the latest health food crazes has stirred controversy over its actual benefits. 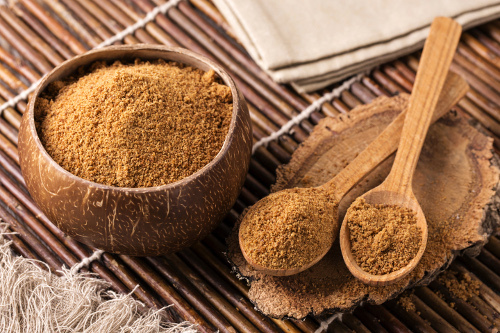 The natural sweet taste of coconut sugar has been used for centuries in South Asia, and many claim it is the perfect substitute for regular sugar. Let’s examine the possible health benefits, and learn how you can incorporate it into your diet, if you wish to make the change. Coconut sugar, or coconut palm sugar, comes from the sap of the flower buds of a coconut palm tree. Supporters claim while it has the same amount of calories and carbohydrates as graduated sugar (as well as a higher price), it may have less impact on your blood sugar, and contains actual vitamins and minerals. What we do know is that coconut sugar does have small amounts of nutrients, and may offer health benefits in various forms. It should be noted that both coconut sugar and granulated sugar have 15 calories and four grams of carbohydrates per teaspoon. Research conducted by the Food and Nutrition Research Institute shows coconut sugar contains vitamin C, calcium, iron, copper, zinc, magnesium, and phosphorous. Researchers claim it has twice the amount of zinc and iron than regular sugar. It is also proven to have antioxidants, anthocyanidin and inositol, as well as phytonutrients like flavonoids and polyphenols. The Institute refers to these phytonutrients as aids in lowering cholesterol, blood sugar levels, and inflammation. The American Cancer Society promotes plant-based phytonutrients over supplements. As coconut sugar contains insulin, it may prove worthy as a sugar substitute to diabetics, as insulin helps with the body’s response to glucose. Insulin is used to slow the glucose production and absorption process. Insulin also helps to indirectly boost the immune system. The American Diabetes Association suggests using coconut sugar in the same way as regular granulated sugar. A study of type 2 diabetic female patients focused on the successful use of coconut sugar to lower oxidative stress levels, while increasing antioxidant and glycemic levels. This was conducted by the Nutrition Research Center in Department of Biochemistry and Diet Therapy at Tabriz University of Medical Sciences. Our bodies can retain fructose from the fresh fruit we consume by converting it to needed fat. Harvard Health Publications suggests only additional amounts of fructose should be consumed, as noted on Livestrong website. Coconut sugar offers 45% fructose content, while agave nectar has 90% and corn syrup has 55% content. Granulated sugar has the same amount of fructose as coconut sugar. The glycemic index, or GI, is used to measure how carbohydrates directly affect blood sugar levels. Glucose is at the top of this scale at the 100 mark, and is compared against foods to see how fast blood sugar levels are raised. Foods ranked with a high number on the scale can cause levels to fluctuate, and result in the “sugar rush and crash” we all have after eating a chocolate bar, or drinking too much soda. Healthy foods rank low on the index. The glycemic index ranking can depend on the food product and brand, as well as the person tested. The Philippine Department of Agriculture did a study showing coconut sugar measured 35 on the GI scale. Granulated sugar registers between 60 to 75 in the GI scale. Aside from the comparison to other sweeteners and granulated sugar mentioned above, there are no studies giving information on any other possible side effects of coconut sugar. As with all things, moderation is key. Excessive use of any type of sugar can lead to weight gain, cardiovascular disease, and inflammation. Follow the instructions below to make your own coconut sugar. Gather freshly harvested coconut sap. It should taste sweet. Boil the sap to evaporate the water over moderate heat, stirring occasionally. The sap should thicken at 115 °C. Use a candy thermometer for an accurate temperature. Turn off the heat, and stir until the sugar is granular. Crush it and store it in a sealed container. Cream together butter and cashew butter until combined. Cream in coconut sugar, maple sugar, and honey until fluffy. Mix in the eggs and vanilla. Add ¹⁄8 teaspoon of the sea salt with the baking soda, cornstarch, and two cups of the flour. Mix and add the remaining cup of flour with the chocolate chunks. Mix until soft and shiny. Chill the dough or place it in freezer for 20 to 30 minutes. Preheat the oven to 350°F. Scoop the dough onto a parchment paper-lined baking sheet. Sprinkle dough balls with remaining salt. Bake for five to six minutes. Note: The dough can be stored in the freezer for one month, and baked cookies can be stored in the freezer for four to five weeks. Coconut sugar is becoming a household staple as users enjoy the sweet taste in recipes and beverages. A natural sweetener, coconut sugar has been used in traditional cooking in South Asia and South-East Asia for centuries. The nutritional aspects of coconut sugar vary from expert to expert with one common factor, it is a product that should be used in moderation. If you enjoy a taste of sweetness, coconut sugar is another option you may choose to switch to. Pourqhassem Gargari, B. et al., “Effects of high performance insulin supplementation on glycemic control and antioxidant status in women with type 2 diabetes,” Diabetes & Metabolism Journal, April 2013; 37(2): 140-148, doi: 10.4093/dmj.2013.37.2.140, last accessed March 31, 2017. “Healthy, Chewy Gluten-Free Chocolate Chunk Cookies,” Natural Sweet Recipes, April 23, 2015; http://www.naturalsweetrecipes.com/chewy-gluten-free-chocolate-chunk-cookies/, last accessed March 30, 2017.